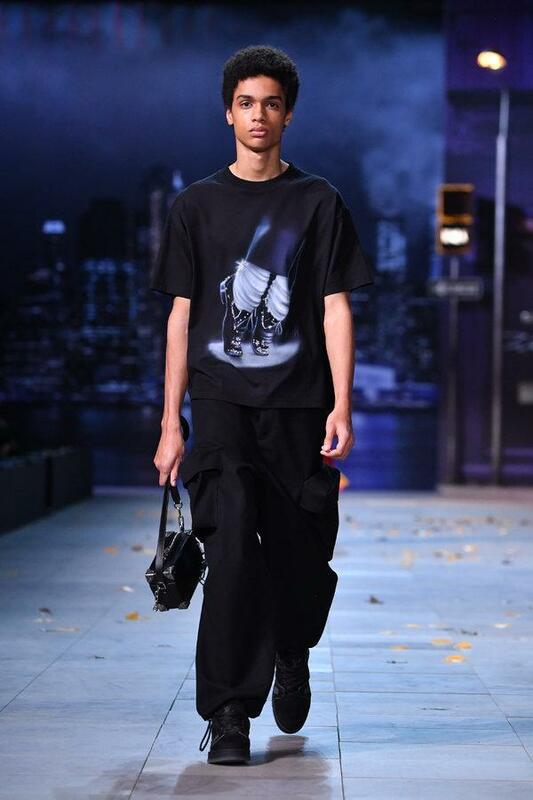 The post Louis Vuitton removes Michael Jackson-inspired pieces from fall 2019 collection appeared first on Daily News Egypt. 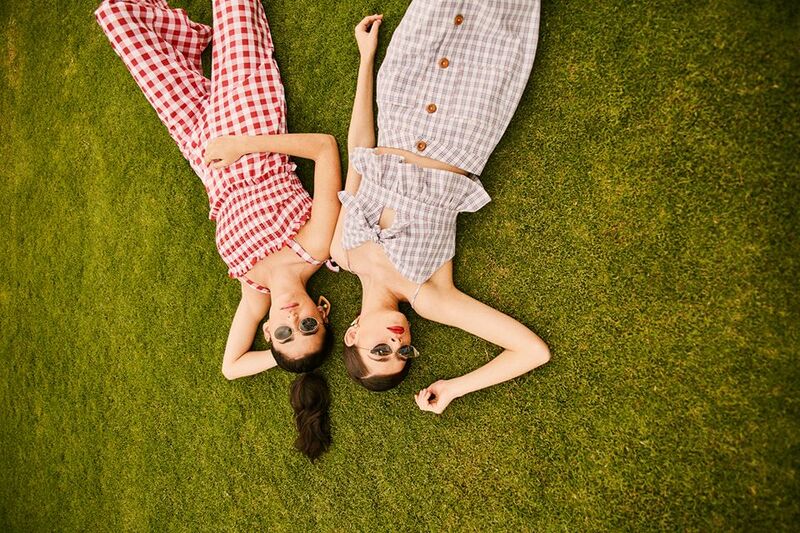 The post By the Sea, MEFF 3 brings regional fashion talent to beach appeared first on Daily News Egypt. For the third year in a row, a combination of fashion experts from around the region came together for a glamorous day. From the Levant all the way to Morocco, they all fluently parleyed with fabrics and embroidery. In order to truly celebrate the warmer season ahead, the Middle East Fashion Festival (MEFF) brought a number of designers and aficionados to the charming coastline of Hurghada. Hosted by City Gate M65, the event featured a bazaar area which offered a variety of merchandise as luxurious as diamonds and gold. Meanwhile, an elevated runway promised a glittering night ahead. On the other hand, a mixture of local and foreign fashion experts flocked toward their seats on either side of the runway. After much anticipation, the show started with a number of speeches and honours before the models started strutting down the runway. Tunisian-Egyptian designer, Sarah Tayel inaugurated the show with a myriad of dreamy couture dresses. Between silver and canary yellow, the dresses agreed on trailing details and hints of illuminating embellishments. The show later proceeded to reveal the rest of the rainbow. The summer collection hopped from fuchsia to aqua blue and coral. Furthermore, it also included navy blue and black. The designer’s preference of light fabrics such as chiffon and lycra helped her to deliver fairytale charm. One of the most memorable looks was a detailed black jumpsuit trailed by a beaded chiffon cape. 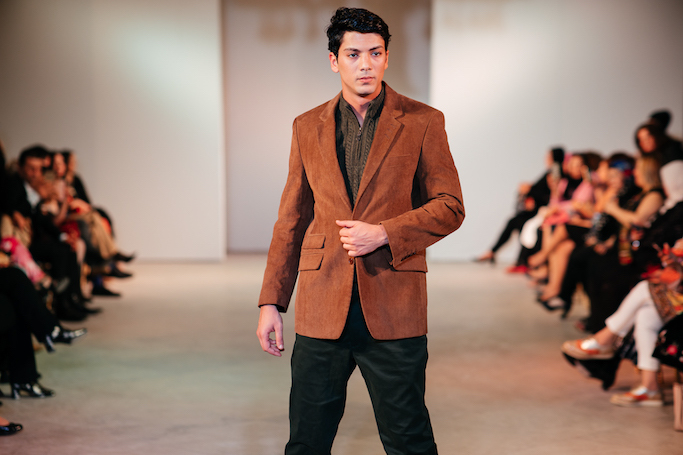 Tayel’s bridal models paved the way to Brand House’s collection of sophisticated and untraditional menswear. Designed by Hassan El Mansy, the collection experimented with rich fabrics such as velvet, combined with subtle details such as double chains and stacked brooches. With that said, El Mansy was also quite keen on breaking the borders of traditional cuts. Designed to fit like a glove, the suits varied between monochrome three pieces to those that blurred the lines between blazers and tailcoats. Syrian designer Omar Mahfouz followed with his couture brand, Joudi Bella. His opening look was nothing less than a maximalist silver dress with feather trimmings. Bella’s collection was both intricate and constantly over the top. Therefore, it was no surprise that his brides were as lavish as queens. Precise busts, oversized skirts, hand-embroidered sequins and extra-long trails composed his winning formula. Finally, Agista took control of the runway with a distinct collection. Starting with swimwear then proceeding all the way to the eveningwear category, the designer was after elegance. For her beach looks, Agista designed retro swimsuits, which she chose to compliment with tulle cover-ups. One of the most memorable looks featured a white one-piece swimsuit paired with a flattering cover-up, which cultivated true Marilyn Monroe vibes. As for the cocktail collection, it varied between playful short dresses with swaying fringes and dazzling options with a dash of bling. At last, the evening collection included swooping dresses with magical silhouettes fit for a true Cinderella. Unfortunately, an unexpected change of weather brought an abrupt end to the amusing night. Due to the hostile wind and sand, the show was prematurely stopped. 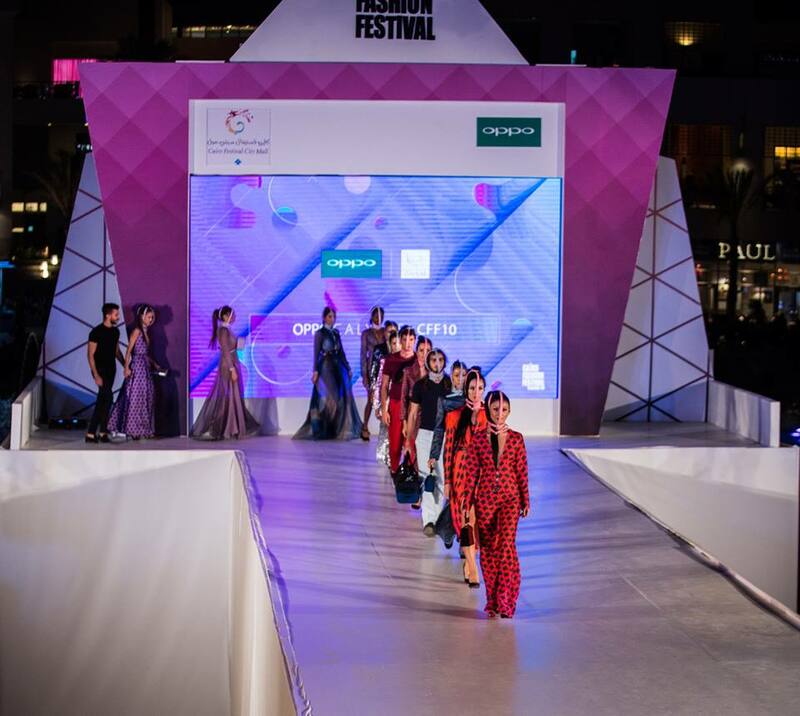 The post Middle East Fashion Festival kicks off showcasing Hurghada’s charm appeared first on Daily News Egypt. The post Dior Dubai Show brings circus to desert appeared first on Daily News Egypt. The post Up-fuse, Farahzada El Shihy create ‘The Ripples’ appeared first on Daily News Egypt. The post Celebrate her Youth: An Initiative to Grow Bolder appeared first on Daily News Egypt. With March being the month of women in general, and mothers in particular, many international brands are already lining up to salute females. Whether through special designs or with dedicated campaigns, local designers jumped on the wagon with few memorable shoots. Nonetheless, jewellery designer Jude Benhalim stood out amidst the trend by choosing to shift the narrative and celebrate mothers in an extraordinary manner. Synonymous with edgy and young jewellery, the designer chose to shed light on women through defying stereotypical age boundaries. With the aim of making mothers feel young and fashionable, Benhalim championed the notion of growing bold rather than old. Her Mother’s Day campaign features a number of mothers who are fierce and glamorous. From the avant-garde styling to the unexpected combination of colours, Benhalim’s leading ladies are an example of embracing beauty at any given age. Under the name, “Celebrate her Youth”, the campaign is an open call for women to wear what they want and not what the society labels as age-appropriate. With that said, the designer’s statement work of hand-carved calligraphy and coloured resin stones occupies centre stage. Shot by Amina Zaher, the editorial shoot elaborately evokes the brand’s attitude as effortlessly carried out by a number of mothers and grandmothers. Aside from the grand goal, the campaign also positions Jude Benhalim as a jewellery brand for all ages. According to the designer, her jewellery is meant to empower, embody, and embolden all women. Walking the same lines of her brand’s ethos, Benhalim believes that as women grow bolder, they tend to grow more comfortable in their own skins, and eventually flourish more confidently with a stronger sense of self-identity. Benhalim started her brand at the young age of 17 with the assistance of her mother and partner, Rana Al Azm. Together, they are always enthusiastic to address and empower women to savour life and follow their dreams. 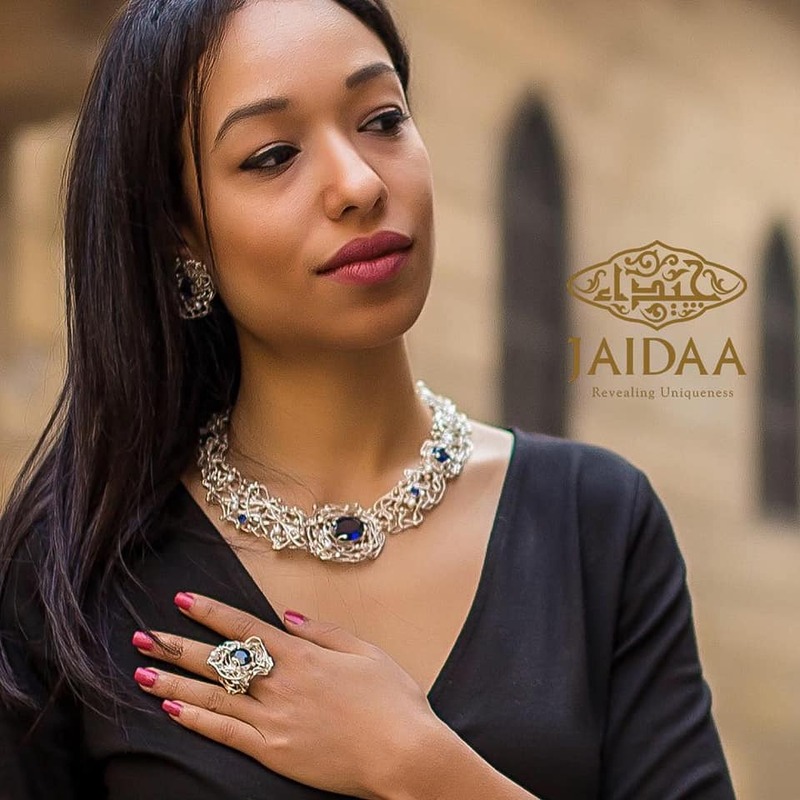 The post Jaidaa Jewellery: synchronised design medley appeared first on Daily News Egypt. Stepping into their showroom feels like crossing the threshold of a cosy house, where cookies are plenty and coffee is always hot. In every direction stands a testament of their attention to detail. While the silver shines vividly, rubies demand attention. Lined up next to each other, each design tells a fraction of their story. Between their lifelong friendship and their 20-year journey in the world of jewellery, Iman and Eva are true artists, who choose silver as their main medium. For 20 years, Jaidaa Jewellery has been synonymous with articulate artistry. The brand’s wide range of silverware includes statement jewellery, contemporary must-haves, and even tableware. Iman Farouk started the journey with her partner Eva as an answer to her talent. 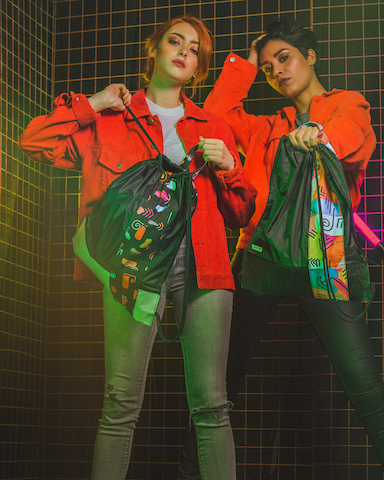 Together, the two designers have managed to turn their casual free time into a thriving brand; meanwhile, they have also developed a growing base of loyal clients. The two founders are always keen on personally welcoming their clients. Over the years, they have even established a personal relationship with all of their clients. In time for the brand’s anniversary, the founders could not help but look back at their early steps and contemplate how a random encounter managed to change their lives. “I come from a family that highly appreciates nature. Accordingly, I am constantly inspired by flowers and plants. However, through my studies, I was forced to leave my passion behind and follow a more traditional direction,” Farouk said. Starting with a few scattered designs here and there, the partners decided to give the brand a name that was far from theirs. Accordingly, they agreed on a distinctive Arabic name; Jaidaa. “It means a slim neck in classical Arabic. This eloquent meaning goes with the idea of a beautiful woman wearing a stunning necklace,” explained Farouk. Together, the two designers complement each other’s aesthetic. Presenting two polar opposites is the founders’ secret formula to target a wider range of women. According to Farouk, they certainly complete each other; even their areas of specialty complement each other. “We were both naturally talented and both of our mothers were equally as talented before us. Therefore, we did not hesitate and started designing right away,” said Farouk cheerfully. Despite what they were capable of creating due to their natural talent, they still knew that they needed to study in order to perfect their skills. After searching for educational centres, the Design Studio by Azza Fahmy came up as a suitable choice given its positive atmosphere and reputable teaching staff. “Until this very day, every time they announce a new suitable course for us, we immediately apply for it. The teachers are quite cooperative and helpful; they even continue to help us long after we finish the courses. They are always reachable for guidance,” said Farouk. Most recently, the two designers attended a class at the Design Studio by Azza Fahmy about the various art movements that have taken place throughout history. Inspired by the information that they learnt, they chose to focus on minimalism and art deco for their latest collection. In time for their 20th anniversary, the brand plans to target a new segment of young clients; therefore, they utilised straight lines and minimal shapes. “Nowadays less is more, favouring simpler concepts is currently a global trend. Therefore, it was a natural choice for us to delve into the art deco school. In parallel, they were also inspired by the oriental tanoura. Accordingly, they reinterpreted its circular shape into minimal jewellery that could be worn every day. With that said, Jaidaa also offers timeless silver tableware that equally attracts different age groups. “We currently have a collaboration with Ghada Nawara, a leading caterer. Meanwhile, we are set to attend a specialised exhibition at the Egyptian embassy in France for the third time,” announced Farouk proudly. According to Farouk, the local market still appreciates silverware. Young housewives are just as enthusiastic about tableware as their mothers before them. “No woman would say no to upgrading her silver collection, even if by just adding a new plate,” said Farouk with a giggle. As for their near-future plans, the best friends plan to study more as they believe that it is never too late to grow further. “I am a grandmother and I plan to go further and grow my brand more. In parallel, we plan to offer more diversity in order to address various age groups,” shared Farouk with an enthusiastic grin. The post Namshi Announces Expansion into Egypt appeared first on Daily News Egypt. With e-commerce being the most promising business on the rise around the region, a new tycoon has announced its intention to enter the Egyptian market. Ever since its inception in 2011, Namshi has been one of the leading e-commerce platforms in the region. Specialised in mid-market goods from fashion to beauty and home ware, Namshi reportedly generated $230m last year, a 16% increase from 2017. Emaar Malls recently completely acquired the platform after buying the remaining 49% stake for $129.5m. With the new plans, the company also highlighted its intention to establish a warehouse and logistical base in Saudi Arabia in order to have direct access to its expanding base of customers. The new warehouse is set to enhance customer service as well as cut down on shipping timeline and costs. This announcement follows Noon’s expansion into the local market earlier this year; another leading regional e-commerce platform. Along with Amazon, they currently represent 30% of the region’s e-commerce market. According to a report from Bain and Company, the region’s e-commerce market is currently worth of $8.3bn, with a 30% per year growth rate. The post Mikiel Benyamin: Egyptian Stylist Taking Hollywood by Storm appeared first on Daily News Egypt. In the midst of the chaos, when day light is masterfully brought to the heart of night and greenery is planted indoors, the cameras point to one joint direction while hundreds of crew members buzz around energetically. To produce a five-minute music video, the industry’s top professionals come together to materialise fantasy in record-breaking timeframes. Accordingly, it is hard to believe that a certain 23-year-old has managed to uproot himself from his hometown in Egypt in order to plant himself in the glamorous world of Hollywood. 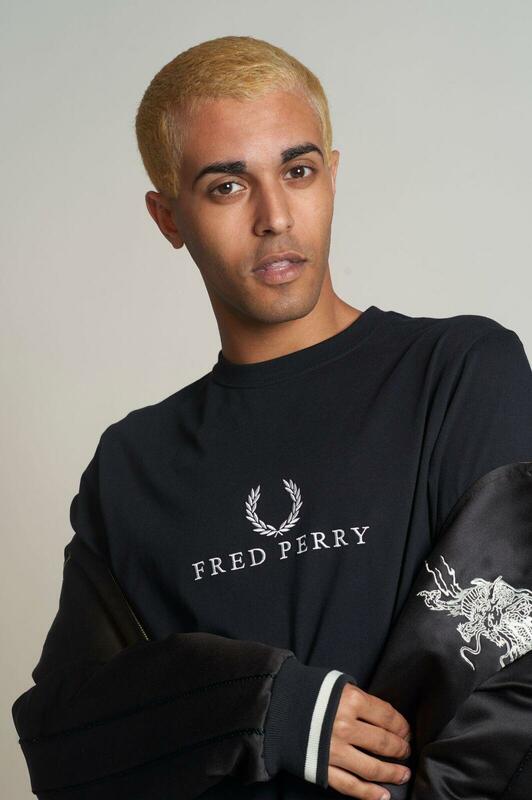 Mikiel Benyamin is an Egyptian celebrity stylist, who has already managed to work with the likes of Cardi B, Bella Thorne, and Sza, among many others. His work has been part of the most viral video clips as well as Hollywood’s top red-carpet events. His journey might be concise in terms of the number of years he has spent in the industry; nevertheless, his rapidly-growing portfolio has already positioned him at the top tier. Benyamin was born and raised in Cairo until the age of 11, when he travelled to the United States with his father. According to him, the abrupt move was anything but easy, especially at the beginning. For a young boy, leaving his family and friends behind was a complicated sacrifice that he had to endure. While having to cope with his new surroundings, Benyamin soon found himself leaning toward the fashion world. At the age of 17, he started to juggle the idea of a fashion career. Even though working in the fashion industry has always been his dream, he never truly knew what to do. “I wanted to make clothes or be a stylist; but, was that even a real job? At the time, I didn’t know. For a while, I tried to understand whether it was a hobby or a job, if I can do it for a living and if I could be paid for it,” said the currently acclaimed stylist. Motivated by his lifelong tendency to dress up and look different, he decided to put his head into it and figure it out. Therefore, his earliest step was accompanying a friend who already worked as a professional stylist. As her assistant, Benyamin got introduced to a wide world of possibilities. “I learned a lot by just working along her side. Then I started working for other stylists and each week brought a different job with it. Soon enough, I found myself working and growing along the way,” stated Benyamin. 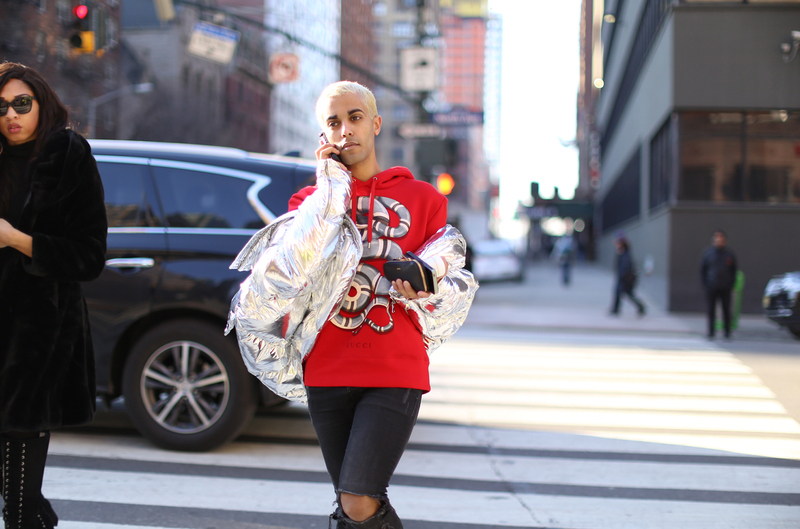 From working with editorial stylists to accompanying a stylist while he worked with the biggest rappers in the US, such as Rihanna – the young Egyptian boy finally found himself at the heart of the global entertainment scene. “A bit by bit, it became bigger and bigger – it took me a while to realise that I have managed to curate a strong portfolio in almost no time,” said Benyamin with an honest grin. According to the stylist, his first big break was no less than styling the award-winning rapper Cardi B. In a time when she was still trying to win over the general public, she did not have access to any reputable designers. Therefore, he was the first to contact her and offer his services. She instantly put her faith in him and together they went on to break the stigma that used to follow her name. While he always contemplates before taking any new step about what would make his family proud, his mantra is to constantly remain as unique as possible. When he first started, he already knew that there were so many different stylists; but, he already believed that they were mainly focused on chic aesthetic. “I thought to myself, how can I make this different, should I work with artists that are talked about more or select those who are not known for their fashion choices then turn them into fashion mavens? I thought in different ways that would help me get people’s attention,” said the stylist to the stars. However, all of these questions evaporated when he secured the most-sought after video clip of the year. Bodak Yellow by Cardi B repositioned the rapper and broke several records. It was also dubbed as the music video of the year given its viewership online. “I think Bodak Yellow was definitely a restart point to my career. It was like okay, I worked for free as an assistant for so long and now here you are working on the biggest music video in America,” said Banyamin proudly. Despite the fact that he is constantly surrounded by stars and has access to the most coveted venues and events, Benyamin believes that his job is anything but glamorous. On the contrary, he repeatedly reinforces that in reality being a stylist is a hectic job, which requires hours of non-stop work. “Once you decide to become a professional stylist, you have to dedicate your life to your clients; it is no longer yours. For example, your clients might call you at two in the morning asking for something and you would have to leave your bed, go get them what they need and make them happy,” shared the stylist. With that said, he is quite proud of working with all of his clients. As he certainly believes that he was lucky to work with each of his female clients because each of them had a different life and experience. From Cardi B to Bella Thorn, sweetie, Sza, Normani and Shantal Jeffery, he is very happy that he got to work with such a wide range of talent.”I could have never thought that I would reach some of them and I have and it still amazes me,” said Benyamin passionately. Leaving his country at a young age with his dad has brought Benyamin closer to his father and his country. “My dad is a doctor and he has never asked me to choose a certain path. At the beginning, he could not fathom why I would voluntarily do the donkey work for free. To this day, he still does not really understand my hours or the details of my job but he is quite supportive and proud,” said Benyamin with a warm smile. On the other hand, the stylist is currently keen on visiting Egypt every year in order to remain in touch with his family and friends as well as catch up on the events that take place all year round. In spite of having his entire life in the US, he still feels at home in Egypt. “I actually keep up with news and events taking place in Egypt. I love few of the local designers, which I am currently quite connected with. I love Kojak and Okhtein for example. And I would certainly love to collaborate with them. It would be fantastic to give big moments to Egyptian designers,” said the stylist, who would love to target noteworthy red carpets or award shows to connect his two worlds in front of global cameras. The post Stella McCartney introduces sustainable eyewear appeared first on Daily News Egypt. As a lifelong vegetarian and a conscious designer, Stella McCartney is notorious for advocating ethical fashion. From being one of the earliest designers to ban real fur and leather, to her constant strive to embrace the latest technologies, McCartney is credited with making the fashion industry environment friendly. With that said, the designer recently decided to continue her commitment through launching a sustainable eyewear collection. Developed in partnership with Kering Eyewear, the collection utilises the latest cutting-edge technologies and responsibly-sourced materials, including bio-acetates. The biodegradable material is renewable and phthalate free, which makes it effortlessly balance the brand’s luxurious aesthetic with its drive to reduce pollution. The collection favours statement frames that inspire a retro aesthetic borrowed from the 1970s and 1980s. With the designer’s name spelled out in rhinestones, these pairs are traffic stoppers. Meanwhile, the collection also introduces cat-eye shaped optical glasses for those who prefer subtle drama. The post Kojak works with female artisans to explore gypsy life appeared first on Daily News Egypt. 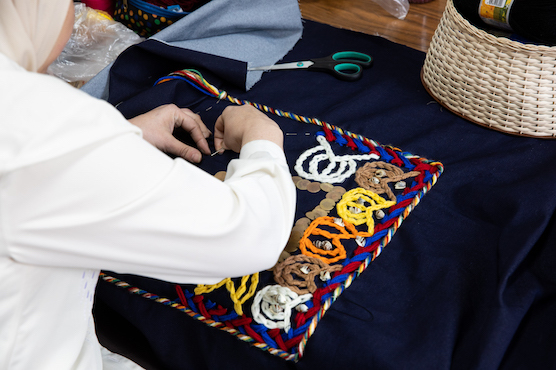 With the political and economic turmoil taking over the Middle East, creative industries such as fashion are deemed to embrace more socially-constructive approaches sooner rather than later. While beautiful clothes are often the focal point of any fashion house on the rise, regional and local talents are currently more focused on garments which deliver eloquent messages to a pro-active audience. 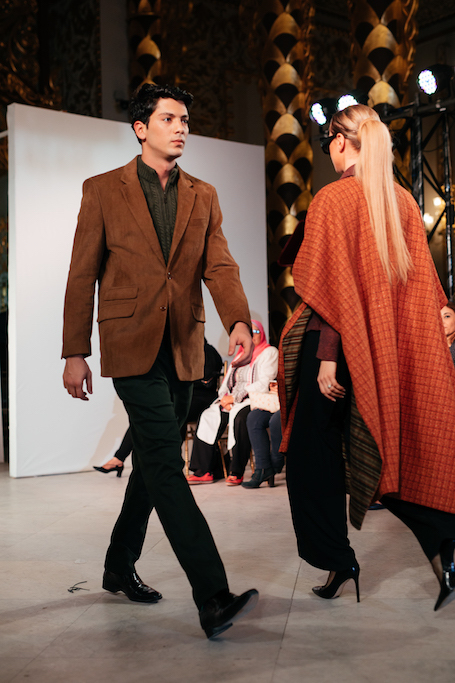 Mohanad Kojak is one of the most recognised names who are currently making an impact in the regional fashion scene. Known for his peculiar style and honest interpretation of sizzling topics, the young designer is constantly keen on translating the country’s heart-beat into garments. While the world is still divided over the immigration crisis and the on-going war taking hold of Syria, the fashion designer once again chose to express his thoughts through fabrics. “It all started when we approached the International Organisation for Migration because we wanted to highlight that Kojak as a brand is always keen on evoking social impact within different aspects and in different directions,” said Kojak while sitting at his picturesque office in the heart of Garden City, Cairo. The designer, who has previously tackled subjects such as sexual orientation and family detachment, is on the path to not only educate people, but also to open their eyes to various uncommon topics. He said, “Recently, I have heard many people claiming that Syrians are replacing Egyptians in certain domains,” Kojak added passionately, “such accusation has never appealed to me and I never thought that it is even valid; if someone is qualified for the job then he cannot be replaced.” On the contrary, the designer believes that their skills have created healthy competition, as it can be regarded as an invitation for the local talent to work harder to maintain its place. “Syrian workforce has the ability to help our economy in many ways. Many businesses have already benefited from this change. Accordingly, I wanted to highlight the idea of inclusivity through incorporating both cultures and identities,” explained Kojak. Motivated by his convictions, the designer started working on this social project last year. Between developing a programme and finding the right artisans, Kojak admits that the road included multiple road pumps. According to him, reaching final decisions with the IOM was not simple. Nonetheless, at the end, the team settled on including five women, a mix of Egyptians and Syrians, and had them work on a mini collection. “We interviewed about 30 women in order to find these five heroines, who complete each other and fulfil cohesive tasks,” stated Kojak. The designer’s main goal was for him to help them develop their skills. “I started with what they were already great at, afterwards, I focused my attention on widening their perspective and connecting them with current trends,” explained Kojak. As the designer would choose to summarise it, he worked with the female artisans to help them find means to capitalise their time and effort in order to create garments that are suitable for the right target segment. “Creating beautiful creations is great. Yet, is it truly what people want now?” wondered the designer. Due to the strict selection process, the participating seamstresses already knew their way around fabrics and materials; they even created amazing garments. However, they lacked a sincere connection with the market to fathom what truly sells today. On the other hand, the team also collectively worked on enhancing the artisan’s finish as well as their ability to edit their work to reach pieces that have a strong story; yet, are still wearable and contemporary. With that said, the participants were asked to create ready to wear pieces out of left-over materials. “I wanted to limit them in order to make them appreciate their resources far more in the future. Artisans often tend to find excuses such as shortage of fabrics. Therefore, working with limited resources can make you change your perspective,” said Kojak. According to the designer, the girls did in fact absorb all the information quite fast as he has seen them work on things that are cool and interesting; yet, still reflect their own DNA. The main theme of the capsule collection was a result of a group brainstorming session. Inspired by the artisans’ individual stories, the collection focuses on the gypsy life. 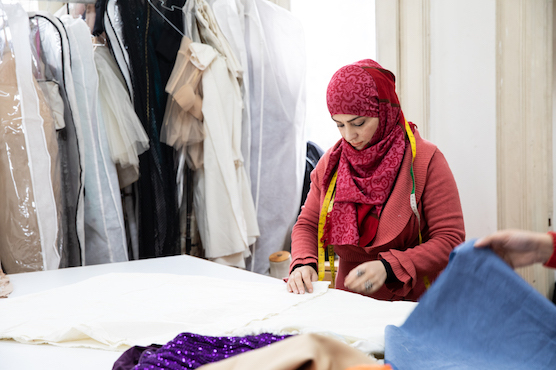 After leaving her hometown in Syria five years ago, Hanouf spent a year in Turkey before moving to Egypt, where she pursued her career as a tailor and established her own workshop. “I am mostly happy about working on a certain Abaya, for which I used three different types of fabrics, each piece was only half a metre. I have also mastered mixing and matching contradicting colours and patterns. This experience made me much more courageous,” stated Hanouf with a giggle. In parallel, Lamia’s favourite piece from this collection is a two-layer skirt. “At the beginning, I had doubts because I only had a very small piece of fabric to work with. Yet, I was proud of the end result. It merited me a new perspective on the potential of each and every scrap of fabric,” said Lamia excitedly. Due to the selected materials, the collection depended on patch work and rich embroidery, which showcased the participants’ techniques. As for the silhouettes, the team wanted to mainly target practical women, who want something to wear to either on a shopping trip or for a brunch, therefore, favoured loose fits. Meanwhile, they included versatile pieces that can be layered. The post Dior to bring its SS19 haute couture to Dubai appeared first on Daily News Egypt. With female acrobats pulling off their most magnificent tricks in mid-air, “the metaphor- women supporting women, was not lost on anybody” said Dior’s Creative Director, Maria Grazia Chiuri, the first female designer to lead the fashion house. The audience seasoned the show with gasps of excitement and breathless attention as the models strutted down the runway. From the designer’s signature tulle dresses floating through the guests to the tailored suits, the displayed fashion radiated with grandeur and brilliance. The Parisian fashion house, Christian Dior, recently announced their intention to bring a replica of their most recent couture show to the one and only Dubai, in the UAE. The team is set to organise their first couture show in the Middle East in March 2019. The show will include the brand’s SS19 collection, as well as a few exclusive pieces designed for the region. For Dubai, it is a major fashion moment. Chiuri is to fly to Dubai for the historic event. The post MITCHA: digitalising local fashion scene appeared first on Daily News Egypt. With the local fashion scene thriving with new talents, the made-in-Egypt label has become a trendy must have. From haute couture to athleisure and accessories, a wide spectrum of local options is not only taking the local market by storm, but is also building a regional fan base. However, as the market is rapidly developing in terms of talent, the purchasing behaviour has been dragging at a much slower pace. Hilda Louca, along with her team of seasoned market experts, decided to take a leap of faith. Together they have created an e-commerce platform to celebrate and support local talent. With 20 years of experience in marketing and management, Louca spends her days scouting for new talents and mentoring others. Her brainchild, MITCHA is a local platform for curated fashion. The team works day and night to bring together a variety of home-grown designers in one easy-to-use digital platform, which follows international standards. The founders rule by simplicity, elegance, and modernity, all while remaining loyal to their local roots. The idea was first born in 2016. At the time, Louca chose to apply her extensive knowledge by starting with an extensive market research. Soon after, she was determined to change the fashion game by giving more power to customers and unlimited reach to the designers. Accordingly, she partnered with Glint Consulting, a Cairo-based management consulting and investment boutique firm, and Susan Sabet, the founding editor of Pashion magazine. What encouraged you to start MITCHA? I am a very proud Egyptian. MITCHA started with a simple dream: a dream of a fashion culture in Egypt, a dream to revive the glory and elegance of the bygone era when Egyptian women were simple, elegant, yet sophisticated. I looked at the incredible talent and creativity of Egyptian designers, their spirit really inspired me to create MITCHA. These designers go against the stream to create, from finding good craftsmen to buying materials and fabrics that may be available today but not tomorrow. They deserve to shine and be seen. What did you aim to add to the industry? The fashion industry has witnessed a significant growth over the past seven to eight years. Many local artists and designers have successfully created a niche for themselves. Meanwhile, more people started to develop an appetite for everything that is home-grown. We believe that designers deserve better exposure and a wider reach. MITCHA comes as a game-changer by introducing a new culture of fashion. We aim to be a hub for home-grown designers as well as a digital destination for fashion by bringing designers to the right customers through a world-class digital platform. Why should clients buy through your website and not directly from the designer? MITCHA offers a new and unique online shopping experience. Our platform is easy and intuitive to browse. Customers can browse our curated collections and shop styled looks by their favourite designers. They can also mix and match fully styled outfits from head to foot whether for work, weekend, beach, or special occasions. Furthermore, they can complement their looks with statement accessories, bags, and jewellery. Quality is our number one driver; every piece is carefully selected and goes through extensive quality and authenticity checks to be featured on the platform. Our dedicated team of fashion-forward buyers, stylists, and editors scour the fashion landscape for real talents so only the best designers are stocked on MITCHA. We offer a personal service through dedicated customer care, hassle-free shipping in our signature packaging, free returns, and a fully-secured online platform on the web and mobile phones. We faced many challenges and still do. From the designers’ side, we are working with them on several issues; from improving the quality, to overcoming inconsistency and lack of stock, as well as convincing them to not only depend on their social media followers for growth, but to look further and dream bigger. We bring a complete business solution, from photo shooting to marketing campaigns and PR, to quality control, and logistics. All that should support designers to showcase their pieces to the world, eliminating all the hassle they go through, so they can focus on creating art. There is a whole industry that is emerging behind the designers, and every touch point needs to be done right. How would you evaluate the current status of e-commerce in Egypt? The need for e-commerce and online shopping in Egypt is increasing by the hour, yet there is still a huge space for growth. Some barriers still exist especially when it comes to buying fashion items. For example, while a customer would opt to purchase her bakery, grocery and household items from online marketplaces, the same customer may prefer face-to-face interaction when buying a pair of new boots or a piece of jewellery. Others may prefer dealing directly on Facebook or Instagram in what we call a very developed ‘social e-commerce’ for fashion. We built a true e-commerce solution that offers an attractive, efficient and secure alternative which preserves and guarantees both customers’ and designers’ rights under one platform. Customers can track their orders, build wish lists, manage their returns, and give feedback, all in one place at the press of a button and from the comfort of their homes. It is a cultural mindset that we are trying to build and it is growing. What are the most common stereotypes that you often have to deal with? Our efforts are geared toward changing the perceptions of customers about the quality of Egyptian-made garments, accessories, shoes, etc. and the price they are willing to pay for it. Customers may buy a comparable item from a global fashion label for the same price or even higher. We believe that we have a responsibility to educate the market and raise awareness regarding the quality and creativity of our designers. That is why we are uplifting the whole shopping experience to ensure 100% customer satisfaction. We are very determined and passionate to fulfil this dream. The post La Sierra: Jude Benhalim’s wearable safari appeared first on Daily News Egypt. 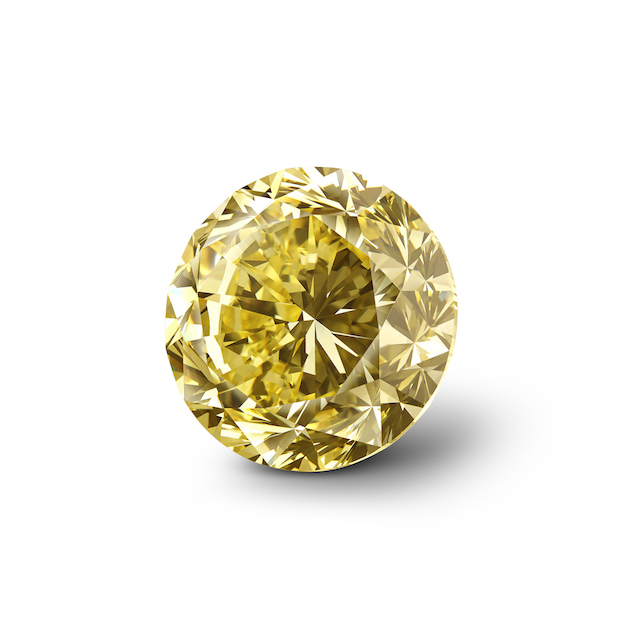 The post Mouawad Dragon: world’s largest round yellow diamond appeared first on Daily News Egypt. The post N by Natalie invites women to ‘Living City’ appeared first on Daily News Egypt. The post Ohhana celebrates ‘Rebirth of Nile’ appeared first on Daily News Egypt. The post Iman Saab launches ready to wear fairy tales appeared first on Daily News Egypt. The post Marie Louis, BTM, bring nostalgia, Egyptian wealth to Winter Season appeared first on Daily News Egypt. Nestled on the edge of the city, her beehive has been working around-the-clock for decades. From one generation to the next, the Bishara family has managed to follow the frantic pace of local fashion to constantly deliver relevant and contemporary styles. Every morning she heads to the place that she knows better than her own house. She walks through the heavy machines as they weave, dye, and put together a spectrum of ensembles. The busy rhythm and systematic moves of the vast factory have always moved in unison, similar to an independent universe, where sketches are turned into seasonal must-haves. Marie Louis is a veteran fashion aficionado, who has managed to continue her family’s legacy and resuscitate the local fashion industry several times. Aside from operating one of the country’s largest apparel factories, she also manages a chain of retail stores around the country, as well as numerous fashion lines, for every member of the family. While her attention has always been divided between local production and international export, the designer has already participated numerous offshore shows. In time for the new season, Louis decided to dedicate her attention to the local market. The designer recently celebrated the launch of her newest collection, which targets both genders—with a special concentration on bridal fashion. “My inspiration came from the earth and the land. Most of the colours utilised were borrowed from Egyptian nature; the greenery that Egypt is synonymous with, as well as the vast surrounding desert,” Louis explained, adding “Accordingly, the collection’s pallet revolves around hues of olive, orange, brown and those colours that dominate the fall season.” Much like the hues often observed between the fallen tree leaves, the collection is both contemporary and nostalgic. Depending on layering as a fashion method to survive extreme temperatures, the collection offers a wide diversity of shawls, coats, and faux fur options. “We wanted to deliver a subtle statement fuelled with unexpected colour combinations. Therefore, we included a variety of shocking fur outerwear such as the lemon-green fur jacket to maintain the theme,” shared the designer. In parallel, Louis also included another theme, which was dominated by vibrant shades of turquoise and fuchsia. According to the designer, this mini story was inspired by precious stones, which Egypt is quite rich in. Aside from the eloquent colours selected for this collection, the designer was also inspired by an unforgettable moment in time. “The 1960s was a very important era for local fashion. It was a transitional period, which witnessed massive advancements,” said the designer passionately. Between the straight lines, delicate cuts, and Charleston trousers, the collection is peppered with all the retro trends that are currently making an evident comeback. “This season has already brought back wide-leg trousers and capes, as well as the big volumes that Pierre Cardin used to favour. Therefore, I was keen to also give a nod to such an instrumental decade,” said the designer with her customary warm smile. Along with the tailored power looks for women and the smart outfits for 21st century men, the collection included a number of bridal dresses that indicate a new milestone for the brand. The long-awaited collection was first showcased during a private fashion show. Organized in the heart of Manial Palace, the 45-minute show was attended by the industry’s most prominent experts and media representatives. It started with casual womenswear before delving into the designer’s timeless take on millennial menswear. Finally, the show was wrapped up with a number of white dresses, which brought fairy tales right to the runway. The historic palace was an ideal choice for the nostalgic collection given its high ceilings, elaborate gold details, state-of-the-art pillars and grand chandlers; iconic details that went hand-in-hand with the garments, as well as the designer’s plan to base her newest creations on the country’s historic and natural wealth. Given the brand’s long history, Marie Louis, BTM is already known for their grand fashion shows, which have previously taken place at breathtaking venues around the world. According to the designer, her recent hiatus from elaborate presentations was due to her pre-occupation with the operational side of her business. “I have been quite busy recently. We have a vertical operation; starting from weaving to dying, printing, and finishing. Our main focus was exports, as well as our base of clients abroad,” shared the designer. However, she is now aware of the fact that the local market needs a revamp. Accordingly, the Fall/Winter 2018 season is in fact the ideal time for Louis to take care of the Egyptian market, especially following the recent fluctuation. “Our products are currently very suitable to the market in terms of quality and price. It is the right time for a strong show to create the needed buzz,” declared the designer with apparent excitement. As the brand can only promise further growth and more collections that will be passed from one generation to the next, the Bishara family is currently also on the verge of launching their newest family member to take fashion as a lifetime passion and profession. Louis chose to introduce her daughter to the audience by the end of the show. Anne Marie Kirollos is Louis’s uber-talented daughter and the mastermind behind one of the country’s most anticipated brands. “Anne Marie has been getting prepared since her childhood years. She has been taking part in all of my shows since the age of two or three, and she has always found her true passion backstage,” said the designer lovingly. The ambitious daughter surprised Louis at the age of 13 with her interest in designing. According to the designer, she could not believe at the time that talent and passion can pass from one generation to the next through mere genes. The post Valuable tips for choosing the right consulting coach appeared first on Daily News Egypt. Making the choice to invest in consulting sessions with an experienced coach marks a key step in your consulting career path. Not only do you trust this professional to guide you, but you will also learn a lot about optimising your abilities and demonstrating your skills and strengths as a professional consultant. So just what should you consider when choosing a consulting coach? I have come across several resources, generic lists and guidelines which offer advice on what to look for when choosing a consulting coach. However, while these lists provided good deliberation points, they address significantly very little about the fundamental value you should be benefitting from these consulting sessions. Now while these guidelines offer you the basic preparedness points, it does not tell you what you should expect to take away from the sessions with the right consulting coach. Therefore, let us take a more in-depth look at what value you can expect from choosing the right coach. The right consulting coach will not direct your attention to what everyone else knows. The role of a consultant is to resolve problems and provide answers or propose recommendations to the business-related question the client is asking. How to solve the problem is something that is taught in academia which includes solving the problem using any one of the many prepackaged exemplars. The right coach will instruct you on how to utilise your knowledge and skill to deliver client-driven solutions. While exemplars constitute the foundation of problem-solving, knowing how to offer client-driven solutions through constructing your own exemplar, based on the customer’s needs, remains the main unique way to stand out. While tracking your performance is a service most coaches offer, it does not offer the self-assessment questions you will be asking yourself. Am I prepared? Will I be equipped? Select a consulting coach that will assess your performance after every case practice. Written performance reports, goal-specific feedback, and a scoring system will all offer you goal-specific advice on the key performance areas, and how best to focus your planning efforts. A written report will allow you to continuously assess your performance and enable you to focus your attention where it is needed. The internet is replete with resources that offer you all the information, videos, and guidelines that explain to you all the tricks and secrets to acing the case interview. However, what you learn in theory vs the realistic practical experience can be significantly different. In theory, you comprehend what to expect therefore when something does not go according to plan, it can leave you feeling unprepared. Therefore, it is important when you come to choose a consulting coach that you take the time to research and fully comprehend what to expect from your coaching sessions. 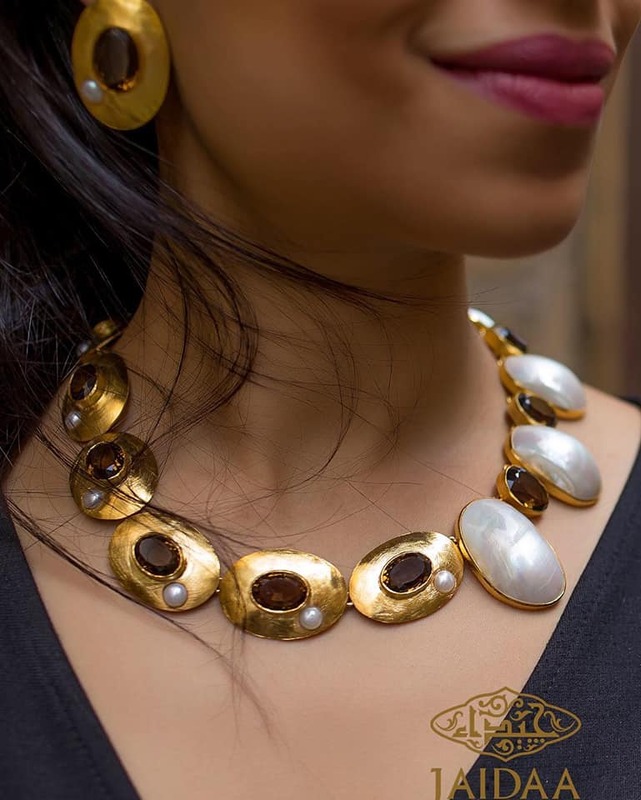 The post Azza Fahmy Continues to march West appeared first on Daily News Egypt. 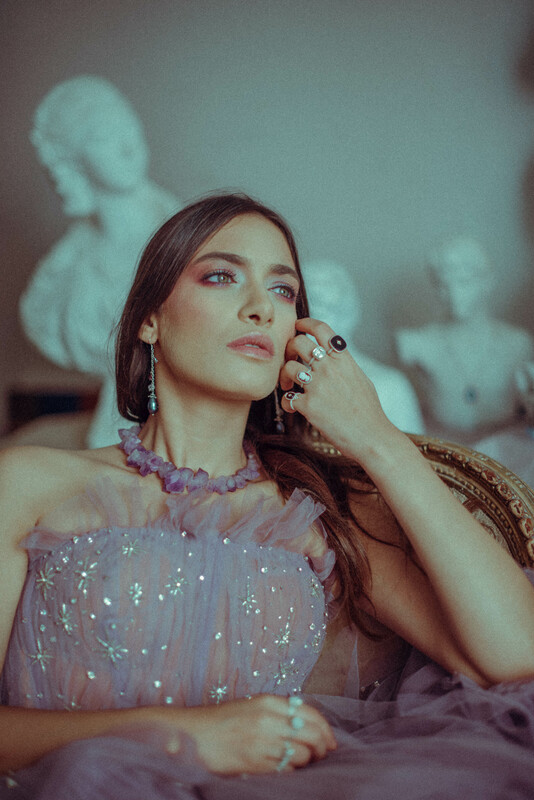 Only months after celebrating their first flagship store in London, Azza Fahmy has decided to take one step further towards international expansion. 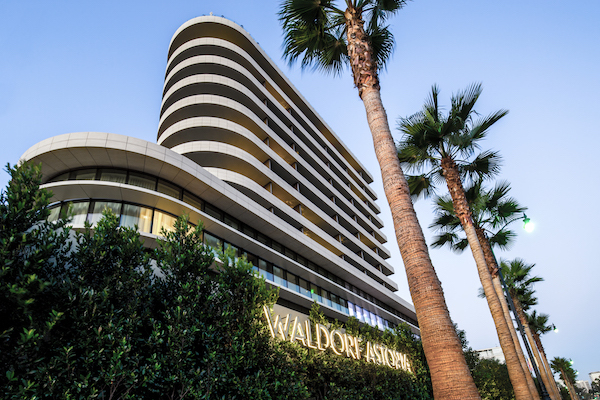 The luxury jewellery legend, has recently announced the opening of their first US boutique, located at the iconic Waldorf Astoria in Los Angeles. Known for redefining cultural and historic references into contemporary wearable art, the brand is set to address American audience with an exclusive hand-crafted collection. Furthermore, a curated selection of the brand’s most popular bestsellers will also be available. With that said, Azza Fahmy’s famous bespoke design service is also available at the new boutique. “We are delighted to open our first store in the US and particularly at this luxurious new icon. This addition benefits from the Waldorf Astoria’s prime position and strengthens our international retail network of 15 retail doors across the MEA and the UK, together with online retailers, and our own online boutique,” shared Fatma Ghaly, managing director of Azza Fahmy. As a regular choice for regional and international stars, this boutique is expected to welcome Beverly Hills’ finest. Only less than a week after the store’s opening, acclaimed TV presenter Raya Abirached was spotted at the boutique while preparing for nothing less than the Golden Globe awards. The post Amany El-Cherif: 19 years of mixing colours, matching fabrics appeared first on Daily News Egypt. While other children were constantly occupied with Meccano cubes, this girl’s puzzle of choice was made of fabrics. Her eye for details and colours always made her stand out from the crowd. Years before she realised that fashion would be her calling, she used to prepare for each and every weekend with multicolor ensembles. “I have always had a thing for fashion design, perhaps you could call it an admiration that was supported by my mother since a very early age,” said Amany El-Cherif, now a seasoned fashion designer. Back then, she never thought that being able to create her own garments could be transformed into a job. It was not until she lived in the US for a while, that she came to realise the wide spectrum of possibilities which presented themselves to her. With a degree in accounting and a true passion for fashion, El-Cherif decided to follow her artistic impulses and pursue a career in the creative sphere. After starting as a fashion consultant, El-Cherif was encouraged by her move back to Egypt to fully delve into bridal and evening fashion. As the designer often says, fashion design is always driven by pure talent, whereas education can only support it. El-Cherif is a firm believer that talent, as well as acquiring an eye for details and colour, are the foundation of any successful career in fashion. “A lot of people are great dressmakers; yet, not many can match the right combination of fabrics, cuts, and colours,” said the skilled designer. Today she is closer than ever to her rapidly approaching 19-year anniversary. While designing, El-Cherif is always ardent on not leaving any woman out of her reach. According to her, each woman should find at least one option that was created to complement her silhouette. “It is my job as a designer to bring out the best assets of each and every client,” elaborated the designer. While haute couture was El-Cherif’s early start and specialty before evolving into ready-to-wear, today she has a big showroom, which harbours ready-to-wear, bridal, evening wear, and casual clothes. The designer’s client is a sharp and elegant woman, someone who appreciates trends while remaining precise and practical. On the other hand, El-Cherif’s casual line currently targets a younger age, which is constantly looking for trendy pieces. Meanwhile, she is also focused on modest fashion. Even before modesty became a global trend, she has always been quite aware of the size and importance of such marginalised market. As the designer chooses to describe her working process, she approaches each dress as if it was a painting. Her favourite fabrics are those that are handmade or embroidered. In parallel, she prefers light colours. Meanwhile, she enjoys mixing and matching surprising combinations of colours and fabrics. After almost two decades in a relatively young industry, the designer has been at the core of the local fashion scene as it took several leaps. “When I first started, people had various mistaken ideas about the fashion industry, for example the majority used to mistake designers for tailors,” said the designer about her battle to make people see what designers are supposed to be doing. “If you want to find the right dress, then you need to put your trust in a real professional. I got to my prominence after a long howl, however, today it is far better. We currently have a strong and promising generation of young designers,” said the designer proudly. Based on her involvement and observations, she believes that the local fashion industry has already managed to break geographical boundaries and address international markets. Three years ago, designers only dreamt of reaching out to the world. Nonetheless, today they need to leave a remarkable footprint. “We need to grow beyond dazzling runway shows to become masters of high quality and attention to detail. As the Germans say, dresses should be sold for what is inside before what is outside,” explained the designer. With a grand legacy behind her, El-Cherif plans to further develop her quality as well as open up new international channels and portals. The post S.A.D.A.F.A. : profound mother of pearl appeared first on Daily News Egypt. Each time she closes her eyes, she imagines and sees patterns and illuminating precious materials. Her moves are often calculated by the most minimal units of measurements, as her details are always eloquently intricate. Between art and timeless expression, she plans to spread beauty whether in the east or the west. Dina El Sheikh is a designer by nature. However, her road towards becoming a bag designer was in fact paved by various experiments. Her eye for meticulous details has positioned her as a prominent name in a rapidly growing industry. Through her brand, S.A.D.A.F.A, the designer has managed to not only create collectable art pieces, but, she has also managed to subtly and effectively empower one of Egypt’s time tested crafts. Even though she has never imagined herself designing bags, her design-fuelled experiments-ranging from sewing, pattern making, or even creating jewellery-has led her to an unexpected fate. Her lucky trail of coincidences started in 2013, when she picked up the hobby of street photography. “I have always been on a quest to discover new places, but more importantly, I wanted to get closely acquainted with my city, roaming old alleys, trespassing deserted mansions, and entering rundown buildings,” said the artist passionately. Her quick chitchats with strangers as well as her interest in non-traditional venues, rapidly and regularly introduced her to friendly faces and opened her eyes to many hidden gems. According to El Sheikh, Egyptians by nature are very talented and masters in artistries. Yet, they tend to forget these facts about themselves. Saddened that ready-made commodities have already controlled the centre of attention and consumed the majority of local customers, the designer was suddenly inspired to bring back to the spot light the preciousness of handmade art. Aside from her picturesque designs, which instantly standout amidst any given crowd, S.A.D.A.F.A is also quite distinguishable due to the designer’s choice of materials. Far from traditional options such as leather or even brass, El Sheikh favours mother of pearl and abalone. According to her, both materials are romantic mediums to work with. “Their colours are very vivid, iridescent, and ever so versatile. There is a magic to them in how they capture and reflect light. I personally find them just as precious as diamonds, but they have not gained the same attention or propaganda,” described El Sheikh with a fond twinkle in her eyes. With that said, the designer’s main goal behind S.A.D.A.F.A is to revive longstanding Egyptian craftsmanship and techniques by adding a contemporary twist to a long forgotten craft. According to the designer, she aims to flaunt her personal pride in Egyptian handmade skills as well as honour the fact that Egyptian hands delicately craft every single piece. In parallel, as a master of many trades, everything around her is an inspiration. All the traveling and living abroad as a child has taught her to appreciate diverse cultures and surroundings. “I find it fascinating, how people react differently to their environments, especially in how they dress, and how they choose to carry themselves,” said El Sheikh. Moreover, nature on the other hand is one of her constant sources of inspiration. As a firm believer that rich resources are everywhere around those who choose to notice, she advocates the need to simply be more observant and attentive to the planet. For her latest collection, the designer decided to delve into her own childhood memories and revisit the African beauty, Cote d’Ivoire. “Although I have lived there for only two years (1988-1990), it has shaped a great deal of my personality. It was a completely different lifestyle for me, such a rich culture and fascinating people,” explained El Sheikh, who still has a soft spot for the country. With a reminiscent approach in mind, the designer still perceives Cote d’Ivoire as the land of her beautiful childhood dreams, and the closest she could get to Alice living in Wonderland. Aside from her personal admiration for the country, this collection was rather another experiment for the designer. According to El Sheikh, she was very curious to play around with different patterns and colours of abalone shells. In addition, tribal patterns kept on popping in her head, hence taking hold of the collection. “It finally ended with the concept of using earthly tones for the clutches, but, with a touch of vibrant colours through the bag’s agate closure,” elaborated the designer. When asked about where she would like to spot this particular collection, El Sheikh shared that her greatest source of pleasure is seeing different women wearing S.A.D.A.F.A., be it an accomplished public figure, or a young teenage girl. “I always like to remind people that this brand is very close to the heart, I like them to wear my clutches as a form of self-expression, and they are capable of dress in anytime and anywhere,” said the designer with a confident smile. As for what the future still holds for the designer and the brand, El Sheikh prefers to take things one step at a time as she rather enjoys the journey. In the interim, she is far from done with experimenting. The designer already looks forward to exploring with other brand domains. Each detail made to serve grand philosophy. The post ‘Selissa’s Jewelry’: turning scars into beauty appeared first on Daily News Egypt. Intimate, sincere, and outspoken, ‘Selissa’s Jewelry’’ is an unapologetically beautiful brand that aims to address women who hate shackles and boundaries. The homegrown brand depends on unbalanced and chaotic metals to deliver genuine fashion statements. Each piece is an eloquent advocate that recounts a story. Made by women and for women, the brand does not shy away from focusing on the hardships which women face on a regular basis. Most recently, Selissa’s chose to unfold the tales behind the ‘Boulevard of Broken Dreams’. The brand’s debut collection features sincere sensations in a minimal form. Between earrings, rings, bracelets, and bold chokers, the collection depends on the familiarity of geometrical shapes. On the other hand, it delivers a modern twist and raw aesthetic through the hammered finish as well as an unruly elegance. As women often choose to hide their struggles and burdens within themselves, far from those they love the most, this collection plans to achieve the opposite. The intricate pieces transform such hardships into accolades that should be flaunted in public. According to Norhan Selim and her partner Laila Abdelkerim, women should proudly wear such scars. Motivated by the beauty, inspiration, and the strength of women, each detail is made to serve a grand philosophy. The post Menna Khalil delves into “Grandma’s Treasure Box” appeared first on Daily News Egypt. Memories are often acquainted with scents, colours, and events. For a lifetime, what she could remember from her long-gone childhood has managed to guide her. With technology and modern momentum taking over the world, her eye eternally remained loyal to what it saw years before. Trends are momentary, but, fashion tends to move in continuous loops. Rather than surrendering to the tide, she chose to direct the wind – to return to her childhood. In time for the new season, Menna Khalil chose to close her eyes and recollect the her grandmother’s memories. Her newest collection is an ode to a woman, who has shaped her personality. Composed of limited-edition pieces, Khalil’s Fall 2018/19 collection was forged encompassing the sense of nostalgia; a longing of her grandmother’s scent; mouth-watering cooking, and her voice as she narrated story after story about her favourite pieces of jewellery. Frequently known for tackling cultural topics inspired by iconic poets, painters, and philosophers – this collection is one of her most personal creations. This eloquent statement comes as a personal experience, and attempt to immortalise her grandmother. When Khalil was told by a supplier that some of her favourite stones can no longer be stocked, she decided to use her 12-year-old collection and create a love letter to days long gone. The grand idea took almost a year to be executed. While flirting with the in the back of her mind, the designer invested the time in collecting materials and precious stones. Meanwhile, she had her eyes set on vintage-jewellery auctions. When all the dots aligned in October, she started working on the pieces. In a matter of 37 days, Khalil was able to create 160 different designs distributed over 210 pieces. Instead of duplicating her designs, Khalil wanted to share her sense of intimacy with her clients. Accordingly, she gave her clients the utmost exclusivity in order to make them enjoy the possibility of actually wearing their grandmother’s jewellery. Fuelled with gold chains and vintage coins, the collection merges timeless aesthetics with the season’s top jewellery trends. Meanwhile, the designer’s personal style could be vividly seen in many pieces. According to Khalil, her grandmother cultivated an exceptional taste, often preferring vintage and authentic pieces. “She commonly wore statement jewellery, and yet, in her everyday life she was simple and elegant, and smelt like honeysuckle flower, one of my favourite floral scents,” remembered Khalil with a reminiscent smile. With that said, the collection is inspired by various trends and historical, cultural and societal movements; from the 19th century to the 1990s. Meanwhile, it is not limited to a certain culture or country. “You will find pieces inspired by the Edwardian, Georgian, and Byzantine eras. From French aesthetics to Italian detailing; Pharaonic, Indian, Chinese, and Japanese personas are also present,” explained Khalil. Accordingly, the collection caters to a large audience of diverse ages. Nevertheless, all the pieces aim to communicate personal messages that anyone can easily relate to. “Giving a chance to all my friends and customers to own pieces again from the past,” shared Khalil. As her brand’s most skilled representative, Khalil always chooses to flaunt her jewellery. Her fingers are often an elaborate display of her most memorable designs. Meanwhile, she tends to stack her necklaces and bracelets in a mixture of admiration and pride. From this collection, the designer chose a retro English gold bracelet which she defines as delicate. Aside from her artistic venture into the past, Khalil also has a few other things lined up for the upcoming year. While she plans to start the year with an exotic trip to both refresh herself and get inspired, she is also focused on expanding her business. The designer already has a showroom and private workshop in the pipeline. Meanwhile, she plans to launch her website and restock the best sellers of her previous 13 collections. The post Winter Equinox Fashion Brunch: invitation for shopping, charity appeared first on Daily News Egypt. Once again, the capital had a rendezvous with Fashion Fund’s seasonal brunch event. Over the duration of seven hours, the country’s most recognised fashion experts and socialites shopped the latest trends, courtesy of Egypt’s finest designers, while devouring mouth-watering delicacies. 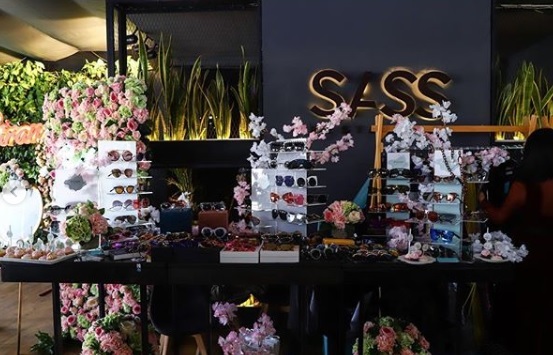 Organised by the well-known philanthropist and socialite, Heba Serag El-Din, the Winter Equinox Fashion Brunch aimed to newly bridge the gap between fashion and charity. Aside from being an ideal destination for shopaholics, the event also promised 15% of the proceedings to a selected charity mission. While the exact cause is yet undetermined, last season’s proceedings went to a transplant case. Instead of giving the money to charity organisations, Serag El-Din prefers to oversee the entire process herself. Therefore, she personally identifies and locates the needy cases. Hosted at Sass restaurant and bar, the event corresponded with the introduction of a new brunch menu. On the other hand, it also shed the light on numerous local talents, while it also welcomed the beginning of a new season. Selected based on the quality, presentation and branding, the featured designers varied between emerging talents and well-established households such as Bazic; Hype; Boutique 17; Avalanche; Unmatched; Trophy Wives; Georges Sara & Co; Moda Fit; Zag Store; Posh Shades and Camicie. All in all, the event featured 14 designers and brands. 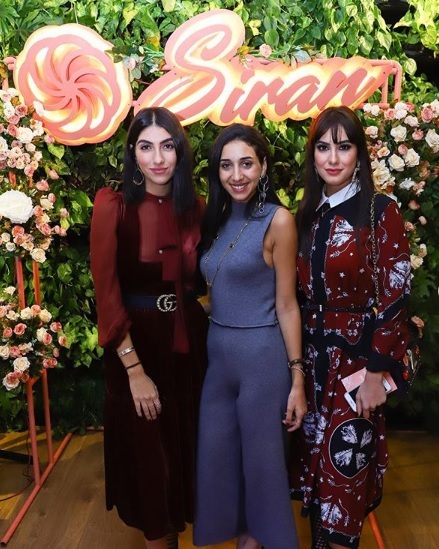 Meanwhile, the event also included a themed photo-booth by Iram Jewellery, the local synonym for glitz and glam, offered a sneak peek of the newest Siran collection as guests tried on the contemporary pieces and even snapped a few glamorous pictures. In parallel, BTC watches offered a timepiece fortress. The celebrated brand gave guests a discerning segment of international iconic watches. Celebrities such as Mona Zaki stopped their rounds throughout the venue just to admire the new collection. With that said, the event’s biggest highlight was the reveal and auction of Zaam’s new exclusive pyramid bag. The Polylogue featured the designer’s love for retro aesthetics and keenness on utilising only the finest real leather. More importantly, all the proceedings collected from the auction went to charity. Concurently, the attendees included a vast number of well-known celebrities and influencers including actresses Mona Zaki and Dalia El-Beheri as well as TV presenters Sherif Nour El-Din, Samar Yousry and Karine Fahmy. Meanwhile, fashion influencers such as Zayneb Azzam, Heba El Dessouky, and Gehad Abdalla were also spotted during the event. 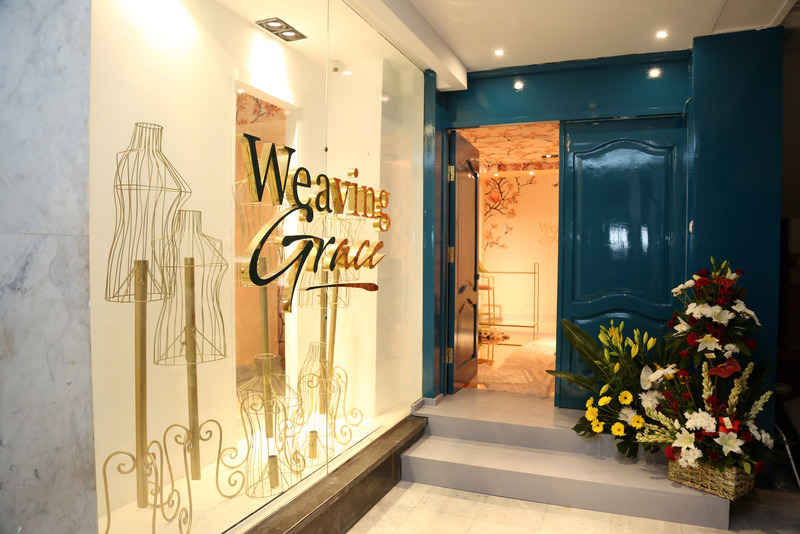 The post Weaving Grace: bridal haven in Zamalek appeared first on Daily News Egypt. 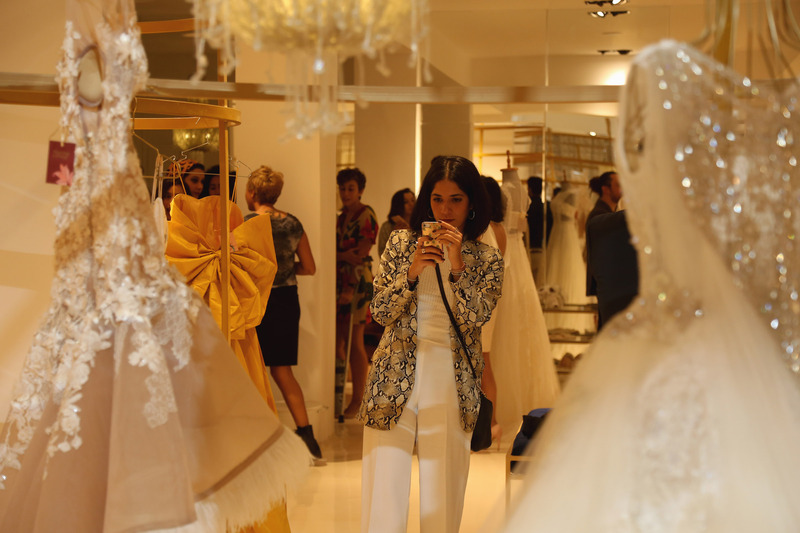 The post Jude Benhalim celebrates her first flagship store in Cairo appeared first on Daily News Egypt. The post Naomi Filmer challenges essence of jewellery design concept appeared first on Daily News Egypt. While the world might perceive jewellery as a decorative luxury, she approaches it as a method of self-expression. To her, each piece is not a mere just a replaceable accessory; but rather an extension of her own personality. 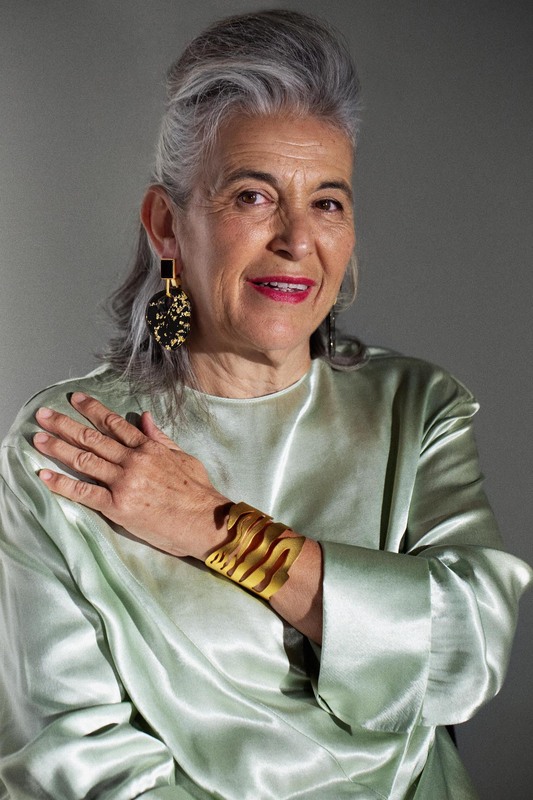 Over the duration of 25 years, she has spent many nights analysing the connection between jewellery and the body – do gestures require specific designs or do they in fact inspire it. Often seen moulding and reshaping materials to her own creative whims, she is a shaper of all things intriguing – someone who does not plan to limit her potential in order to appeal to commercial preferences or short-lived trends. After studying jewellery and metalsmithing at the Royal College of Art, Naomi Filmer has embarked on a journey of designing, experimenting and tutoring. For over 20 years, she has found true joy and excitement in teaching ambitious talents between London and Europe. On the other hand, exhibitions have always been her method to creatively vent and delve into intricate subjects. Much like an intense love story, before long, Filmer completely fell in love with jewellery design and all its secrets. She best describes her versatile projects as an exciting trail that has shaped her as a designer. Her most notable catwalk collaborations, include her work with Hussein Chalayan and Alexander McQueen, as well as working on fashion exhibitions for international fashion curators, such as Judith Clark. On the other hand, Filmer spent a handful of years freelancing as a senior designer in Milan. Most recently, the jewellery aficionado took a plane towards Cairo, Egypt to meet he eager students of The Design Studio by Azza Fahmy. Her concise workshop did not only widen their horizons, but it has also introduced her to new hypotheses. What made you pursue a career in jewellery design? I am interested in challenging conventional and traditional jewellery through creating pieces that explore the relationship between the body, objects, and materials. My career is in fact broader and vaguer than you might think, as I do not make jewellery and I do not describe myself as a jewellery designer. I am a designer-maker, who creates pieces about the body rather than pieces to be worn on the body. I work and flirt with the world of jewellery and in doing so, I cross borders between design, craftsmanship, jewellery, contemporary accessories, and fashion. What are you always keen to add to the international jewellery scene? 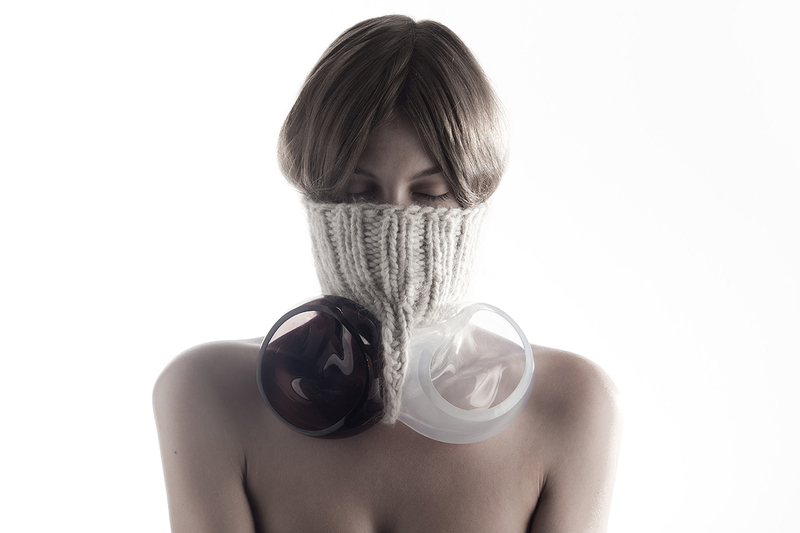 I hope that my work encourages new attitudes towards the role of jewellery, materials and our bodies. As my work is not part of a commercial scene, I do not aspire to offer trends or aesthetic direction. Instead, I aim to open up discussion channels regarding the role of jewellery beyond adornment and display. After working with the likes of McQueen and Hussein Chalayan, which of your previous collaborations would you define as a favourite? I do not have a favourite. Out of the catwalk collaborative projects, I would say each was unique and offered me different opportunities to pursue new ideas, which was quite rewarding for me. 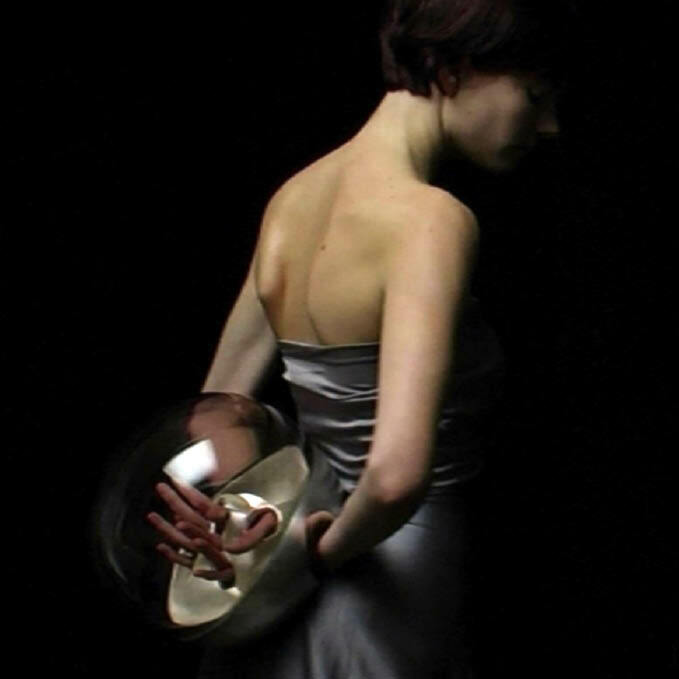 However, I suppose there are some pieces or objects that I connect to more in on the long-term, such as the ‘Orchid Neck Piece’ for Anne Valerie Hash 2008, the ‘Ball in the Small of my Back’ for McQueen 2001, and the ‘Mouth Light’ for Hussein Chalayan 1996. However, as collaborative projects in themselves and in terms of my experience working with the designers, I do not have specific preferences. What encouraged you to give a workshop at the DSAF? I find it interesting how people think and communicate their own expressions and identities through creative practices, as well as how that can change from one culture to the next. The opportunity to come to the DSAF arose through Doris Maninger, one of the original founders of the Alchimia, Contemporary Jewellery School in Florence, who is very involved at the DSAF. We met 18 months ago at the Royal Academy of Arts, Antwerp, where I teach the third year BA jewellery students. Doris regularly visits Antwerp as one of our external examiners and when we meet, I always enjoy our conversations and views on education, as well as the role of jewellery design as a social facilitator on various levels. Doris asked if I would be interested to give a workshop at the DSAF. Later on a warm invitation from Yasmine Hamalawy followed. I am curious about the design studio in Cairo because it seems quite different from the schools where I currently teach. What is the workshop’s main topic? The workshop is based on hand gestures as a mode of self-expression and communication. We all use our hands as an integral tool for communication; yet, that changes from person to person, culture, era, and context. Today we even substitute hand gestures with emoticons in social media, offering universally understood expressions such as appreciation, faith, humour, jubilation, disappointment, etc. 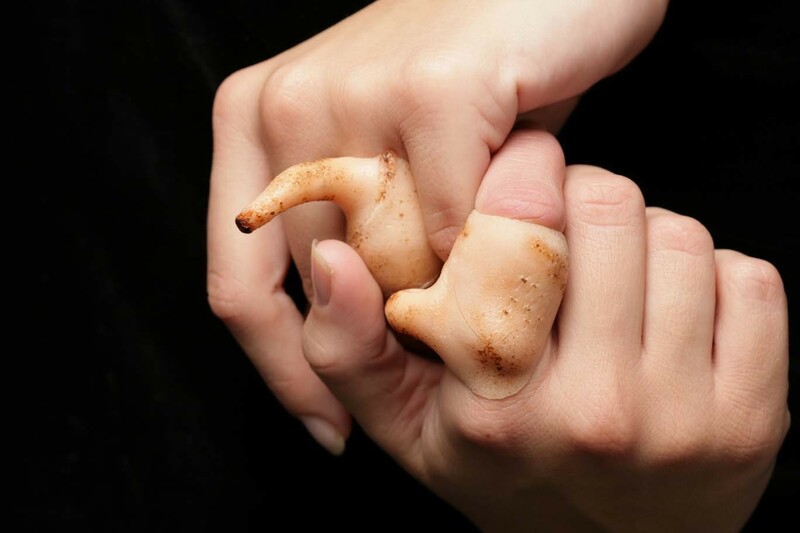 I want to look into how one form of expression demonstrated by the hand can inform and evolve into a piece of jewellery. I want to make wearable gestures with the participants of the workshop. What are you most excited about regarding the workshop? Being my first time in Cairo, Egypt, I am both curious and excited to experience the city, the culture and the people. Travelling for work, I consider it a pleasure and a privilege, because you get to see a different side of the city through the generosity and perspective of those you work with— it is always a learning and enriching experience. Also, this workshop and project is new for me, so I am happy to work on a theme that is close to me, as well as match some of my previous works. Yet, I have never worked on this as a theme in itself for a workshop. What are your near-future plans? In terms of work, I will continue to teach but I also have a couple of other projects in the pipeline. One of which is designing display installations for jewellery brands for a showroom or trade fair context. I am doing this as a collaborative project with a good friend, Alice Ciccolini, who is also a jewellery designer. This interests me as an area because it allows me to focus on a space and a communication platform that lies between the jewellery and the body. It is an area that I believe deserves more attention and tackles much of my experience and knowledge to date, so watch this space! The post The CFF celebrates 10 seasons of fashion, talent, passion appeared first on Daily News Egypt. After a number of opulent runway shows and quirky fashion presentations, the country’s biggest fashion event has celebrated their 10th season on the 25th of October! In time for the remarkable milestone, the team behind the Cairo Fashion Festival (CFF) organised their most memorable season to date. Between a fashion installation, several all-star runway shows, and entertaining presentations, the guests once again experienced local fashion during a memorable night. “This season is dedicated to all the things we have achieved through the CFF. Meanwhile, it is an opportunity to visit our most memorable events. Therefore, it was only fitting that we celebrate with the country’s top designers, who originally started their career with us,” said Omar Madkour, the CFF’s proud founder. After putting on their meticulously thought-through red-carpet outfits, the country’s top fashion aficionados, bloggers, VIPs, celebrities, and media representatives were welcomed with a fashion installation featuring the work of over 30 local designers. While some names have already walked the runways of previous seasons, others were brought to the mix to throw a real fashion fiesta—in the most Egyptian way possible. With the mannequins placed on colourful blocks, the dresses grabbed the most attention and a stream of camera flashes during the entire event. Designers included Vivian Moawad, Bardees, Pacinthe Radwan, Amanda Kamkam, Abayology, Samy Designs, Nesma Helmy, Mona Selim, and Ahmed Nabil among others. After such a grand entrance, up and coming talents got their share of attention with a choreographed fashion presentation. The elevated stage witnessed the debut designs of many fashion students. Represented by Career Gates, the young talents offered a diversified take on the FW18-19 trends. With daring cuts and surprising fabrics, the show garnered multiple positive cheers. Meanwhile, Donia Ashry Studio and Laila Eid also presented two memorable collections. While Ashry favoured a modern minimalistic approach, Eid chose a variety of bold colours and classic cuts. Nonetheless, the most long-awaited presentation was courtesy of menswear designer Moaaz El Behery. After a long hiatus, the designer brought back his contemporary approach to the CFF. His designs addressed millennial gentlemen, who are uninterested to follow in the footsteps of previous generations. That being said, all eyes were now directed on the runway, where the festival’s biggest stars showcased their latest collections. 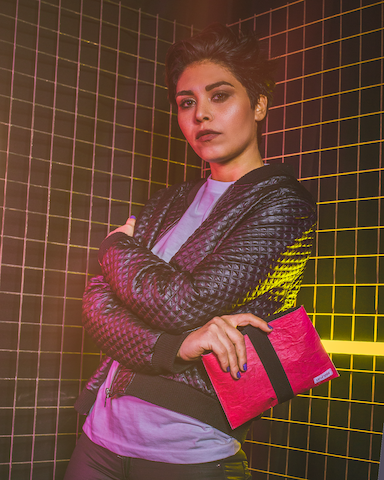 Names such as Bardees, Maison PB, and Malak El Ezzawy made an unmistakable comeback to their original Launchpad. As Bardees once again stood out due to her eye for colour, Maison PB went for a primary colour pallet with mesmerising handmade embellishments. On the other hand, El Ezzawy offered a fresh take on tomorrow’s classics. Furthermore, Vivian Moawad remained loyal to her feminine aesthetics. Confidence depicted her collection in black and gold, while her hemlines embraced edginess. As part of the night’s many surprises, Oppo joined forces with Zaam Designs to incorporate technology with design. Ahmed Azaam utilised his creative talents to develop a limited-edition collection as vibrant as the company’s new mobile phone. Inspired by the gadget’s rainbow of gradient colours, the designer presented a capsule collection of ready-to-wear garments and bags. With avant-garde head pieces and colour-blocked ensembles, the outcome blurred the lines between the two industries. Meanwhile, the grand finale embodied the event’s main purpose and continuous quest. Farida Temraz made an exceptional comeback to the CFF with a daring collection, entitled Femme Formidable. The collection left the audience in awe as each dress made a statement on its own. Between bold black, royal blue, luxurious purple, the designer occupied centre stage.